The posts on either side, which support it. The panel or a pair of panels, usually framed as an oblong or square. The hinges attach the fence gate panel to the post and allow it to swing freely open and closed. Most panels have one hinge at the bottom and another at the top. If a gate is sagging, the problem is usually the supporting posts, the hinge connection, or both. Examine both gateposts. Check them to make sure they are level (perfectly horizontal) and plumb (perfectly straight vertically). One or both of your gateposts may not be exactly upright. You can eyeball this or use a spirit level for greater accuracy. Examine the hinges on the fence gate. Each hinge is typically attached using two sets of lag bolts. A lag bolt (sometimes called a lag screw) is a steel screw used for wood projects. It looks like a screw, but the top is flat, thick, and hexagonal. Note the size of the bolt—1/4-inch, 1/2-inch, and 3/8-inch commonly—in case you have to replace one that is rusted or missing. Disconnect the bottom hinge first. Even if the hinge looks perfectly fine, go ahead and disconnect it by removing the lag bolts with a ratchet or open-ended box wrench. Now tackle the top hinge. Partially disconnect the hinge by removing only the lower lag bolt. Lift and shore up the leaning post. Set stones, bricks, or blocks around the post to prop it up to the desired upright position. A spirit level will give you an accurate reading. You may have to dig around the post to reset it or replace a wooden one that has warped or rotted. Always call the Dig Safe phone number before digging. Reset the top hinge. Once the post is level, reattach the lower lag bolt on the top hinge. Tighten it securely with a ratchet or wrench. Use blocks or stones to prop the fence gate erect or have a helper hold the fence gate steady and straight. Next, reset the bottom hinge. Do not be surprised if you have to reposition the holes in the post: The old holes no longer match up due to wear. Rather than lift the fence gate, your best option is to drill new holes so that the fence gate remains aligned. Moving the hinge just this small amount will correct the angle and prevent the gate from sagging. Use a drill to make new holes that are slightly smaller than the screw that you will use to attach the hinge. For example, use a 3/16-inch drill bit for a 1/4-inch screw. Replace the lag bolts on the bottom hinge. Tighten all the bolts on the top and bottom hinges and either oil the hinges or spray them with WD-40 or a similar lubricant so the fence gate will swing freely without creaking. Repeat these steps on the other gatepost if necessary. 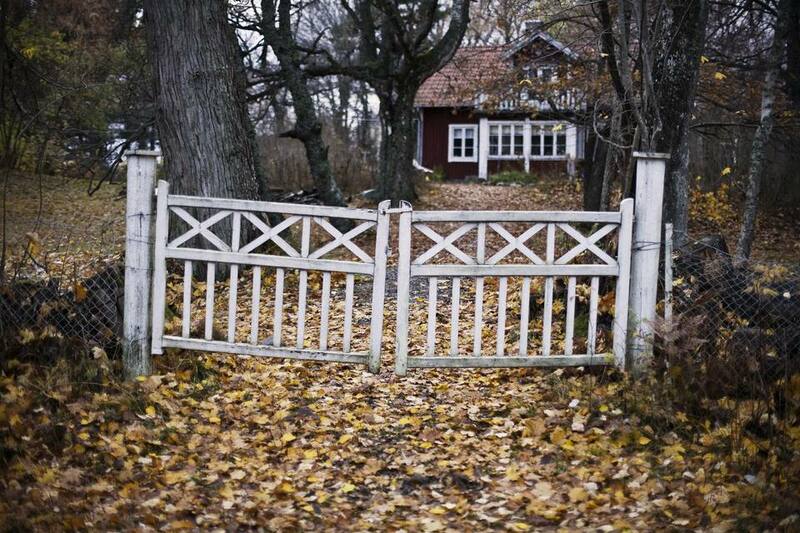 Heavy or long fence gates (such as wooden driveway gates) may need additional support to keep them from sagging again. Installing guy wires—strong metal wiring that attaches fence gates to the tops of their posts—can help keep them level. You may want to check out gate wire kits for this purpose; these usually contain all the parts required in a single package.